Enjoying a fresh poké bowl below S$10 is almost impossible, much less in the CBD district. We know how the office lunch crowd can be a real struggle, and let’s not forget the first-world problem of not knowing what to eat. Some days, your hawker favourite is just not worth the sweaty mess you’ll become after braving the heat in office clothes. On the other hand, you can’t seem to reconcile your wallet with fancy restaurants as a daily option. Unagi VS Salmon takes away your lunchtime woes of fussing over what to eat. 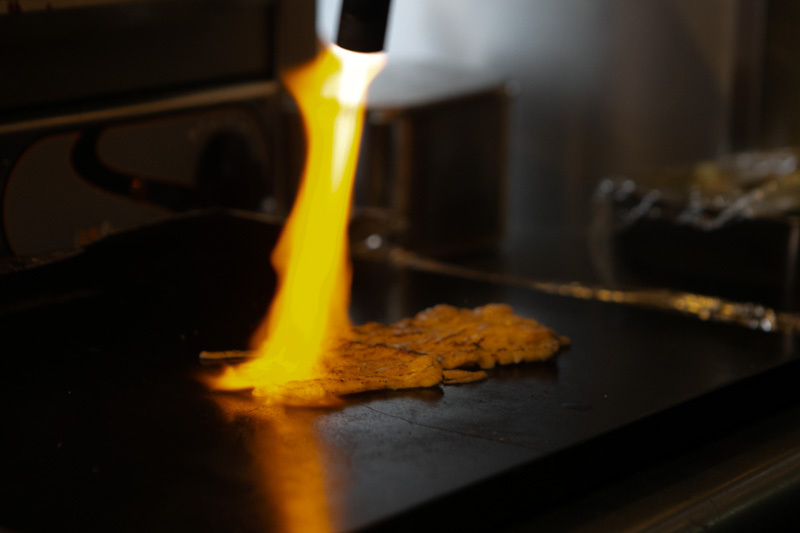 Rest assured they cover all bases: affordable, healthy and filling. Unagi VS Salmon is a cosy and casual Japanese restaurant nestled in a quiet corner of Icon Village. They serve up DIY bowls where diners can choose a base and a main for just S$9.90. 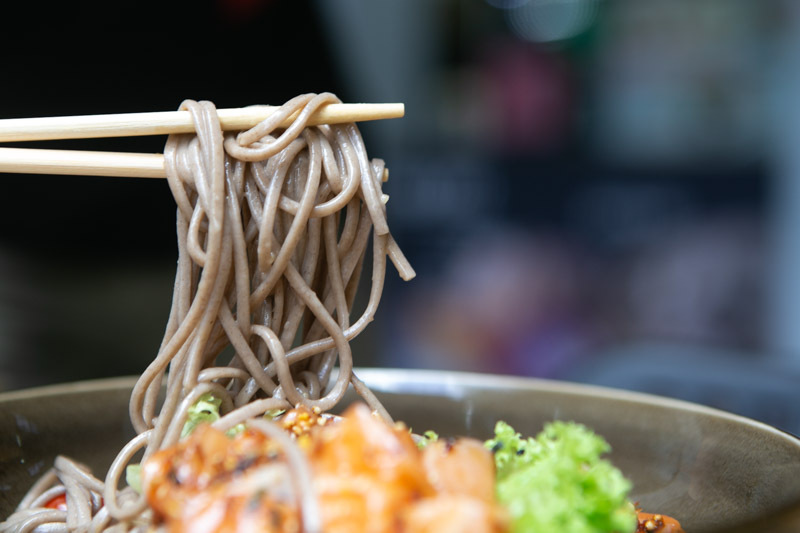 You can pick between mixed red rice, soba, green salad or pasta for your base. You’ll probably be spoilt for choice for your mains, since you can choose between salmon or unagi prepared in various ways. Otherwise, you could just order their Unagi VS Salmon bowl which gives you the best of both worlds for just S$15.90, complete with an onsen egg and avocado slices. We were surprised when the boss, Mr Eric, shared with us that he was previously in the trading and finance industry before he decided to pursue his passion in the F&B sector. 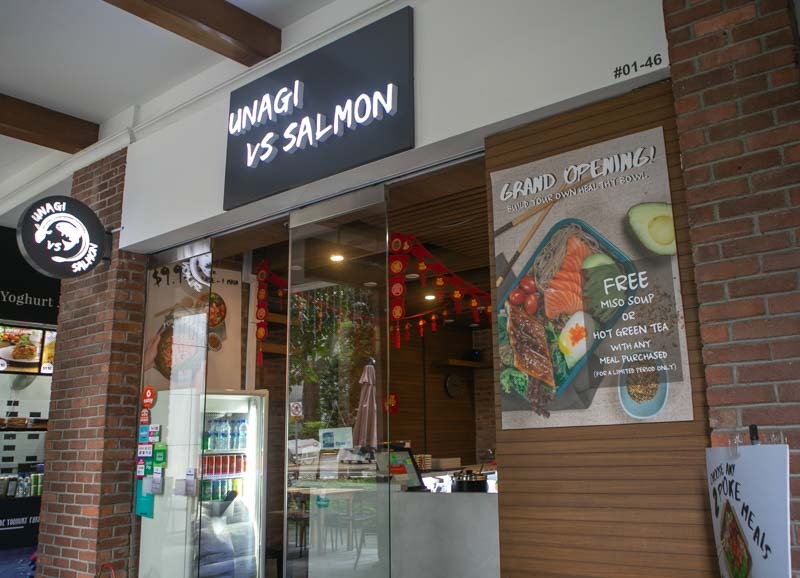 Unagi VS Salmon is his first foray into the F&B industry, created with the intention of providing office workers with a healthy and affordable lunch, in the comfort of air-conditioning. We had high expectations for the Aburi Salmon Mentaiko (S$9.90) after seeing it torched in front of us. The smokey fragrance was pronounced in every mouthful and there was an undeniable creamy texture. It didn’t quite meet the mark of melting in my mouth like some others I’ve tasted, but that’s a minor issue. Otherwise, each bite was rather flavourful, with a tasty mentaiko sauce coupled with crunchy ebiko (shrimp roe) topping the salmon. 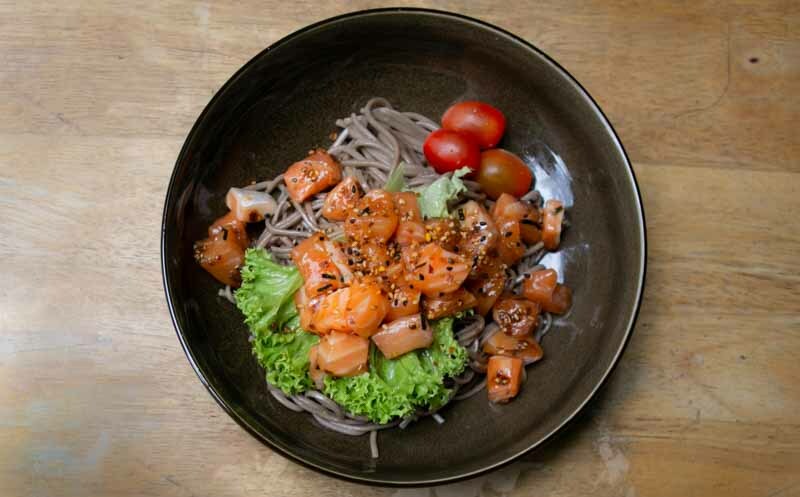 The Salmon Poké And Soba (S$9.90) was our second pick. Poké bowl fanatics would know that the freshness of the fish is what makes or breaks the dish. Unagi VS Salmon guarantees that freshness with the daily delivery of Norwegian salmon and unagi to the store. 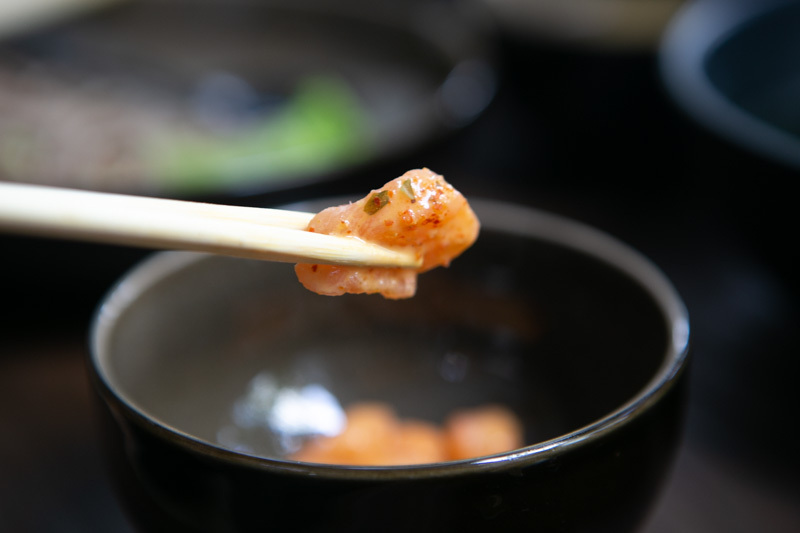 The diced salmon was marinated in a slightly sweet sauce handmade by the boss himself. The furikake (Japanese rice seasoning) delivered an instant explosion of umami in the first bite. I was rather impressed that the natural sweetness of the salmon was retained despite the strong seasoning. The soba was cooked to perfection, with the right amount of bite. Both bowls were rather refreshing and appetising, especially with the accompanying green salad. If you’re a fan of spicy food, the Spicy Garlic Poké (S$9.90) is definitely the one for you. Beyond the instant spicy kick, the chilli had a fragrance to it, reminding us of chicken rice chilli. Mr Eric shared that his chilli marinade actually consisted of nine ingredients. It’s almost mandatory for Japanese cuisine to come with a bowl of miso soup but what piqued my interest was the number of ingredients in it. 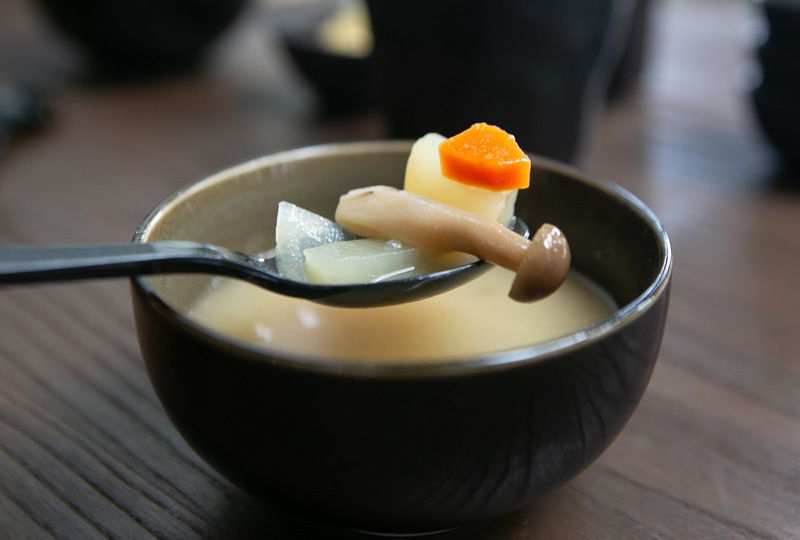 You’ll expect a piece of tofu at most, but Unagi VS Salmon serves their miso soup with four ingredients — white radish, carrots, mushrooms and onions. I liked the thoughtful addition of extra ingredients which gave the soup a homely taste. 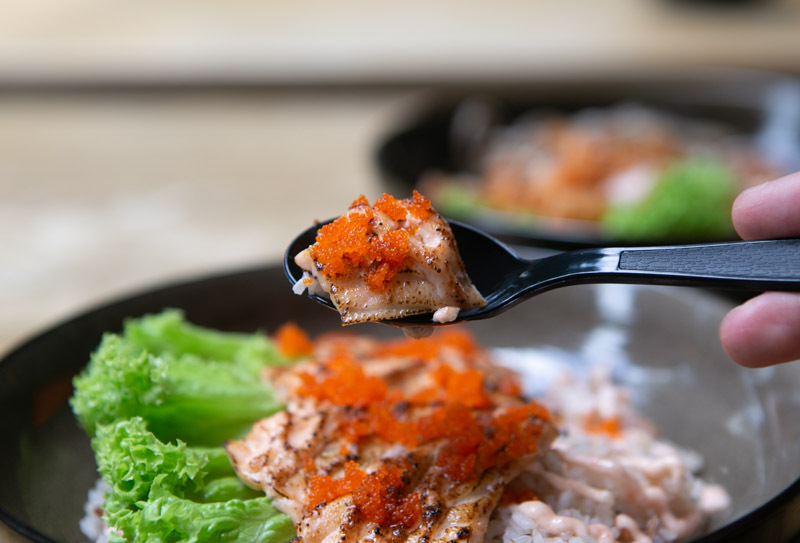 As someone who loves poké bowls, there’s nothing not to love about the ones served here at Unagi VS Salmon, bearing in mind the super affordable price tag of only S$9.90. 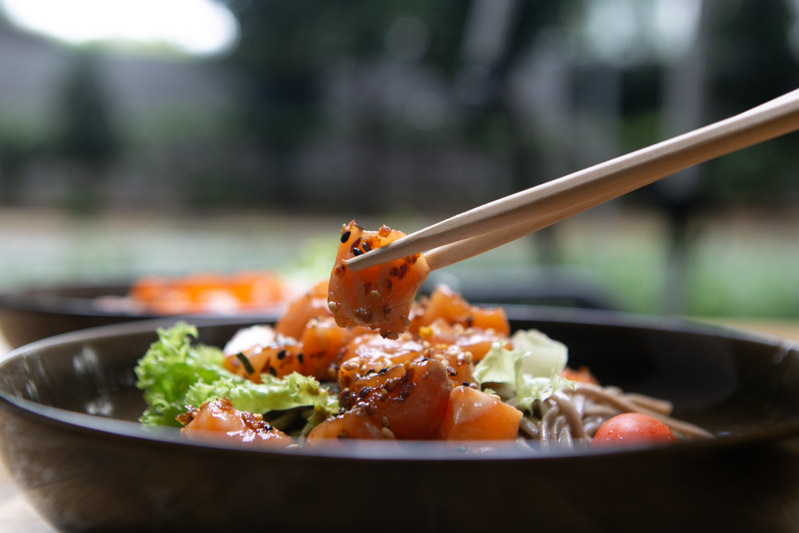 Their emphasis on freshness and quality of ingredients have certainly made all the difference in serving up one of the most affordable and healthy poké bowls around. Trust me when I say that your lunch woes will soon be a thing of the past with this new kid on the block. Free-flow miso soup and Japanese green tea are also served with every main purchased as part of their launch. If you’re one to enjoy eating in the comfort of your own office, be sure to tabao one of their poké bowls for your next lunch!